A bold front-running performance by Beauty's Beast landed a winning treble for Winona Costin at Rosehill on Saturday. 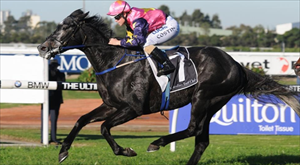 Costin was able to bring up her trio of winners from the first six races on the program and in the process, brought up 50 metropolitan wins for the season which will see her claim reduced from 2kg to 1.5kg, effective from next Wednesday at Warwick Farm. Her earlier wins came aboard Queen Of Kariba for John Sargent and Intrepid Way for co-trainers Amanda Turner and Mauro Poletti. Beauty's Beast, trained by Danny O'Brien at Flemington, had tasted previous success at Rosehill recording a win, a second and a sixth from three starts. On Saturday Costin rated Beauty's Beast ($11) beautifully in front and the pair held off a late charge by Mirage ($4.80) from the Peter Moody stable to score by three-quarters of a length. The Chris Waller-trained You'll Never ($8) finished another three-quarters of a length back in third. The $4 favourite Good Value disappointed back in seventh, beaten almost 4-1/2 lengths. "It's been a great day,” Costin said. "The horse really enjoys getting out to the lead, he hangs in a fair bit but I was fortunate enough to get him off the fence down the straight and he really hit the line strongly. "I thought I had quite an easy time in front so when I got to the 600 (metres), I started skipping away from the other horses. The grey gelding was the second Victorian-trained horse to win on the program after Kapour, prepared by Ciaron Maher at Caulfield, claimed the Listed ATC Winter Cup (2400m) earlier in the day.